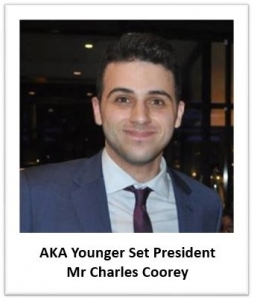 It’s my pleasure as AKA Younger Set President to speak on what it’s like to be a young Australian of Kfarsghabi descent. I could start by talking about traditions like summers spent on Kibbee Hill at Coogee Beach or eating Hareesi on the Feast Day of Mar Awtel. But it’s also important to acknowledge how privileged we are to live in Australia, a land of peace and opportunity. We are also privileged to be the sons and daughters of those brave men and women who left behind their families and came to this land to begin a new life, a life we all benefit from, today. Let me make it clear, today’s Kfarsghabi youth value the sacrifices and opportunities made by our parents and those came before them. Our traits of hard work and commitment to education are borne out of their struggles. We’ve listened as our grandparents’ recollect our cultural and religious foundations, traditions and faith in Jesus Christ that are ingrained in us today. Like the 7 Kfarsghabi who made their journey to Australia 130 years ago, today’s youth support each other during the good and bad times. A lot of people are overwhelmed to see so many Kfarsghabi youth paying their respects at wakes and funerals. We, the youth, also know the best holiday we’ll ever have is in Lebanon, in Kfarsghab, the place we all belong to – even if you’ve never been. It is where our tree of life still grows strongly today, a tree whose seeds others have planted in Australia and elsewhere round the world. We come back from Lebanon with more than just an appreciation of Arabic music. We bring back lifelong friendships with the youth who live in Kfarsghab, friendships that flourish through Facebook and social media. Today, in a world where technology and online communications prevail, the AKA Youngerset is still a platform for face to face interaction and the making of lifelong friendships, not only among our people, but also with many non-Kfarsghabi youth who attend our functions. As proud as we are of our Kfarsghabi heritage, it is Australia that we dearly love most and call home. Through goodwill, education and hard work, our generation of Kfarsghabi youth will also make positive contributions to the best country in the world.